With their book club season wrapping up with The Florida Life of Thomas Edison, Sassy and Bridgy decide to take their group on a day trip to the beautiful Edison and Ford Winter Estates. Hiring driver Oscar Frieland, who’s known for his colorful stories and love of the café’s Robert Frost fruit tartlets, the bibliophiles set off for a day of sunshine and history. After a lovely excursion, the club returns to the café for lunch and a book discussion, but the group falls silent after Oscar is found dead in his van. The sheriff’s deputies have some questions of their own for the group, and if the ladies don’t find some answers soon, the next book they read might be from a prison library. 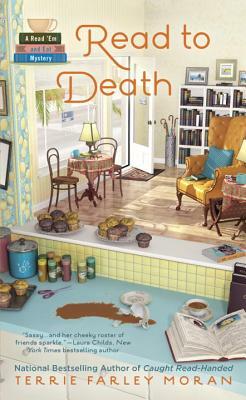 Short-listed twice for The Best American Mystery Stories, Terrie Farley Moran is the national bestselling author of the Read ’Em and Eat Mysteries, featuring Caught Read-Handed and Well Read Then Dead. The only thing Terrie enjoys more than wrangling mystery plots into submission is playing games and reading stories with any or all of her grandchildren.